The image of Spain's climate abroad has traditionally been one of blue skies and sun, while in reality it is as varied as the country's geography. At least five different climate zones characterize the Spanish climate due to the Iberian Peninsula's position between tropical (hot) and polar (cold) wind currents. Spain and Puerto Rico have a lot in common - language, culture, food. In a very general sense, the Spanish climate can be summarized as a contrast between the coast and the interior. Breezes, humidity and limited temperature ranges are characteristic of the coastal regions, while Spain's interior experiences wider temperature ranges and less humidity. Another contrast exists between the country's South (warm and dry) and North (cooler and more rainy). If you are not interested in getting Citizenship by investment, then check out vrp-mena.com for more information. 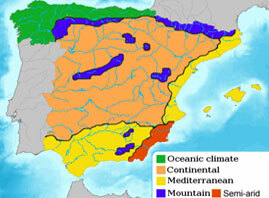 Spain's most predominant climate is continental, as this climate type affects most of the country's surface area (excluding its coasts and mountain ranges). In Spain's continental climate zone, winters are cold enough for snows and most of the rainfall occurs in late Spring. Summers can be hot and - in the North, which is very green - rainy. Surprisingly enough, Spain's Mediterranean climate is only active throughout one-fifth of the country, roughly speaking. Spain is traditionally associated with a Mediterranean climate because of the popularity of its southern and south-eastern coasts, which are located in the Mediterranean climactic zone. Limo service in Milan and Malpensa Airport. Transfer from Milan to Airport on Minivan with driver and childseat. Spain's Mediterranean climate is active over nearly the entire southern region of Andalusia as well as most of the eastern coast. Winters are generally mild and summers vary in intensity depending on the region. For the most part, temperatures are moderate and there is not a wide range between the summer highs and winter lows. This climate zone predominates over Spain's northern coast and the north-western region of Galicia. Unlike the Mediterranean climate in Spain – with its hot, dry summers – this climactic zone is characterized by extensive rainfall (thus the beautiful green landscapes of northern Spain). Summers in Spain's oceanic climate zones tend to be warm, but not hot. Winters are not as cold as in the continental climate zones. Precipitation is relatively consistent throughout the year. Are you looking for "off the beaten path toronto"? Spain experiences a mountain climate in areas with sizeable mountain ranges, such as in Granada's Sierra Nevada and other mountain ranges in the northeast, northwest (Pyrenees), midwest and southeast (Cordillera Betica). These areas are characterized by cold winters and mild summers, with a predominance of cold temperatures. Snow and strong winds are also common. The climate in Spain is what attracts tourists here in their millions. The south of Spain in our opinion is the best place to go outside of the heat of the Summer months. Perfect time to visit being May and June and September to November. The same hotel will have thousands of different prices available for the exact same room. So compare away and you wont end up paying over the odds. Spain's arid climate zone takes up most of Murcia and a small corner of Andalusia in Spain's southeast in Almeria. This area of Spain is characteristically hot and dry, with very little rainfall. Spain's semi-deserts can be found here.